Dr. Ordway investigates the death of man whose first two wives were murdered. Is there any way to get a copy of this film? 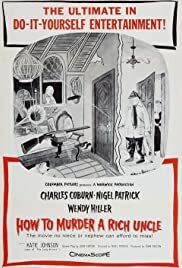 I saw it several times when it was released in the 50s and have never seen it again....I have tried to check on its DVD availability to no avail and have never seen it listed on TV.....It is absolutely hilarious and the cast contains actors who were famous veterans and some (Anthony Newley and Michael Caine) appearing in small but marvelous roles. I don't understand why it hasn't had a big following, enough to be able to see it and obtain a copy. Nigel Patrick is at his top form as the patriarch of the family down on its financial luck. One scene has himself and Wendy Hiller dressing as always for dinner which she has had to cook. It's a funny movie in itself, but as a satire of the British stiff upper lip, among other things, it deserves re-seeing many times.